Born in Washington, D.C. in 1956, Diane Ward grew up in the Virginia suburbs of that city. She was one of six children, one of whom died in infancy, and in order support his family, her father worked as an accountant for the General Accounting Office of the U.S. government during the day, and in numerous other jobs in the evenings. He died when Ward was 12. Finances became difficult for the family, and Ward’s two brothers dropped out of school. Her mother worked as a seamstress and for a savings and loan institution. Ward was determined, however, to become an artist, and enrolled in the Corcoran School of Art, which was then an unaccredited institution. There she began taking art courses and also met Doug Lang and Terence Winch, both of whom taught creative writing. Ward began writing poetry, and with Doug Lang moved into a large house whose other tenants included local poet Bernard Welt. At this time, Lang began a reading series at a local bookstore, Folio, whose guests included John Ashbery, Charles Bernstein, and many others. The series influenced several local poets, including Douglas Messerli, Joan Retallack, Lynne Dreyer and Phyllis Rosenzweig, a curator at the Hirschhorn Museum of Art and Sculpture. But Ward notes that she truly realized that she wanted to become a poet only when, one day, she heard a local Radio Pacifica broadcast in which Peter Inman described what he felt a poet was. By the age of 18, Ward won a National Endowment for the Arts grant for poetry. Meanwhile, Lang’s Folio readings had expanded to weekly “workshops,” in which several Washington, D.C. and Baltimore writers read their work to one another. Poets in those workshops included Ward, Lang, Welt, Rosenzweig, Dreyer, Retallack, Messerli, Tina Darragh, Julie Brown, Anselm Hollo, Kirby Malone, Chris Mason, Marshall Reese and others. 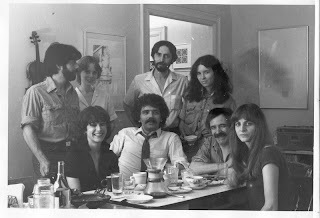 The loss of the communal house and the closing of the Folio bookshop brought an end to this important D.C. group; and, ultimately, Ward moved with a young artist friend to New York City in 1979. There she worked as a freelance typesetter, and helped with distribution and production for Roof Books, one of the major sources of “Language” poetry, edited by James Sherry. While working on the night shift at a typesetting house near Union Square, she met Chris Hauty, the man she would later marry. Hauty also wanted to be a poet, but writing plays and reviewing scripts, he begin to focus more heavily on film, and turned to writing film scripts. Meanwhile, Ward took a job as a production associate at Pantheon books in 1982. In 1987 she moved with Hauty to Los Angeles, where they had two children, George and Jackson. Hauty began working for various film studios, and Ward worked for a while at the Univrsity of California Los angeles, before turning her attention full time to motherhood. She now works as a schoolteacher’s assistant. Through all these years she still found time to devote herself to poetry, writing nine books of poetry and editing, with Phyllis Rosenzweig, a journal published in various forms—fliers, postcards, etc. She has also extensively participated in readings throughout the country. She lives in Santa Monica, California. Reprinted from The New Review of Literature, II, no. 2 (April 2005). Copyright ©2005 by Diane Ward.